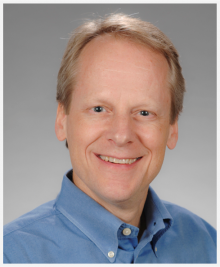 Dr. Swanson’s research has focused on the fundamental mechanisms involved in pre-mRNA processing, including splicing and polyadenylation. A major objective has been to address the question of how RNA processing is regulated during embryonic, fetal and postnatal development and how this regulation is disrupted in neurological disease, particularly in microsatellite expansion disorders. Our primary experimental system is the mouse and we have generated a number of knockout, knockin and transgenic lines to investigate the roles of specific RNA-binding proteins in disease pathogenesis. The human genome contains a complex array of repetitive DNA sequence elements including transposon-derived/interspersed repeats, segmental duplications, large tandemly repeated sequences and simple sequence repeats (microsatellites). Microsatellite instability is associated with nearly 30 hereditary disorders. Disease may result from repeat expansions within a coding region and synthesis of a toxic protein (e.g., Huntington disease). Alternatively, many microsatellites are located in non-coding regions and cause diseases such as spinocerebellar ataxia types 8, 10 and 12 (SCA8, SCA10, SCA12), fragile X-associated tremor ataxia syndrome (FXTAS) and several types of myotonic dystrophy (CDM, DM1, DM2). How do simple repeat expansions in non-coding regions result in disease? To answer this question, we have focused on myotonic dystrophy because it is a dominantly-inherited disorder associated with non-coding CTG and CCTG expansion mutations in two different genes, DMPK (DM1) and CNBP (DM2), which lead to similar disease phenotypes. We proposed the RNA-mediated disease model in which mutant DM1 and DM2 mRNAs are trapped in the nucleus and sequester (C)CUG repeat expansion binding proteins that are essential for normal tissue development and maintenance. Our lab identified these sequestered factors as the muscleblind-like (MBNL) proteins. Ongoing efforts are focused on elucidating the normal functions of these proteins as well as investigating whether RNA toxicity has a pathogenic role in other hereditary disorders. During embryogenesis and postnatal development, mammalian tissues are initially formed and subsequently remodeled to meet the evolving demands of the developing organism. This process requires a dynamic series of biochemical events at both the transcriptional and post-transcriptional levels. While considerable effort has been spent on clarifying DNA sequence elements and trans-acting factors involved in transcriptional regulation, less is known about the post-transcriptional steps required for normal tissue genesis and maturation. Many genes encode multiple protein isoforms that are generated by alterative splicing of pre-mRNAs and we are interested in understanding the mechanistic basis for these splicing transitions during skeletal muscle and brain development. Recent studies have focused on the roles of two families of alternative splicing factors, the MBNL and CELF proteins, in regulating alternative splicing site selection. We are currently investigating additional factors and pathways that impact RNA processing during development and how disruption of these pathways results in disease. The human brain contains ~1011 neurons which are interconnected through a vast network of synapses. This highly interactive cell system requires an extraordinary level of protein diversity, much of which is generated by alternative processing of gene transcripts. The brain is severely affected by the multi-systemic disorder myotonic dystrophy (DM). These CNS effects can be subdivided into developmental (DM type 1 disease only) and degenerative changes (DM1 and DM2). This distinction between DM1 and DM2 in the CNS is strikingly similar to disease-associated effects observed in muscle where developmental abnormalities (e.g., hypotonia, respiratory insufficiency) are only observed in DM1 (congenital DM or CDM) while adult-onset degenerative changes (muscle weakness/wasting) occur in both DM1 and DM2. Our long-term goal is to test the hypothesis that DM-associated CNS deficits result from disruption of the normal steps in the expression and pre-mRNA processing of specific gene transcripts and to clarify how the corresponding biochemical pathways are adversely affected in the DM brain. Thomas JD, Sznajder LJ, Bardhi O, Aslam F, Anastasiadis Z, Scotti MM, Nishino I, Nakamori M, Wang ET, and Swanson MS. 2017. Disrupted prenatal RNA processing and myogenesis in congenital myotonic dystrophy. Genes Dev 31:1122-1133. Batra R, Nelles DA, Pirie E, Blue S, Marina RJ, Wang H, Chaim AI, Thomas JD, Zhang N, Ngyuen V, Aigner S, Xia G, Swanson MS and Yeo G. 2017. Visualization and elimination of toxic microsatellite expansion RNA by RNA-targeting Cas9. Cell 170:in press. Freyermuth, F., Rau, F., Kokunai, Y., Linke, T., Sellier, C., Nakamori, M., Kino, Y., Arandel, L., Jollet, A., Thibault, C., Philipps, M., Vicaire, S., Jost, B., Udd, B., Day, J.W., Duboc, D., Wahbi, K., Matsumura, T., Fujimura, H., Mochizuki, H., Deryckere, F., Kimura, T., Nukina, N., Ishiura, S., Lacroix, V., Campan-Fournier, A., Navratil, V., Chautard, E., Auboeuf, D., Horie, M., Imoto, K., Lee, K.Y., Swanson, M.S., Lopez de Munain, A., Inada, S., Itoh, H., Nakazawa, K., Ashihara, T., Wang, E., Zimmer, T., Furling, D., Takahashi, M.P., N. Charlet-Berguerand. 2016. Splicing mis-regulation of SCN5A contributes to cardiac-conduction delay and heart arrhythmia in myotonic dystrophy. Nat. Commun., 7:11067. doi: 10.1038/ncomms11067. Taliaferro, J.M., Vidaki, M., Oliveira, R., Olson, S., Zhan, L., Saxena, T., Wang, E.T., Graveley, B.R., Gertler, F.B., Swanson, M.S., and C.B. Burge. 2016. Distal alternative last exons localize mRNAs to neural projections. Mol. Cell 61:821-833. Scotti, M., and M.S. Swanson. (2016). RNA mis-splicing in disease. Nat Rev. Genet. 17:19-32. Davis, J., Salomonis, N., Ghearing, N., Lin, S-C. J., Kwong, J.Q., Mohan, A., Swanson, M.S., and J.D. Molkentin. 2015. MBNL1-mediated regulation of pro-differentiation RNAs promotes myofibroblast transformation. Nat. Commun. 6:10084. doi: 10.1038/ncomms10084. Corama, R.J., Stillwagona, S.J., Guggilama, A., Hazena, S.L., Jenkins, M.W., Swanson, M.S., and A.N. Ladd. (2015). Muscleblind-like 1 is required for normal heart valve development in vivo. BMC Dev. Biol. 15:36-55. Goodwin, M., Mohan, A., Batra, R., Lee, K-Y., Charizanis, K., Gómez, F.J.F., Eddarkaoui, S., Sergeant, N., Buée, L., Kimura, T., Clark, H.B., Dalton, J., Takamura, K., Weyn-Vanhentenryck, S., Zhang, C., Reid, T., Ranum, L.P.W., Day, J.W., and M. S. Swanson. (2015). MBNL sequestration by toxic RNAs and RNA mis-processing in the myotonic dystrophy brain. Cell Rep. 12:1159-1168. Rau, F., Lainé, J., Ramanoudjame, L., Ferry, A., Arandel, L., Delalande, O., Jollet, A., Dingli, F., Lee, K-Y., Peccate, C., Lorain, S., Kabashi, E., Loew, D., Swanson, M.S., LeRhumeur, E., Dickson, G., Allamand, V., Marie, J., and D. Furling. 2015. Abnormal splicing switch of DMD penultimate exon compromises muscle fiber maintenance in myotonic dystrophy. Nat. Commun. 6:7205 | DOI: 10.1038/ncomms8205. Batra, R., Manchanda, M., and M.S. Swanson. (2015). Global insights into alternative polyadenylation regulation. RNA Biol. 12:597-602. Xia, G., Gao, Y., Jin, S., Subramony, S., Terada, N., Ranum, L.P., Swanson, M.S., and T. Ashizawa. (2015). Genome modification leads to phenotype reversal in human myotonic dystrophy type 1 induced pluripotent stem-cell derived neural stem cells. Stem Cells 33:1829-1838. Swanson, M.S. 2015. Rectifying RNA splicing errors in hereditary neurodegenerative disease. Proc. Natl. Acad. Sci. USA 112:2637-2638. Batra, R., Charizanis, K., Manchanda, M., Mohan, A., Li, M., Finn, D.J., Goodwin, M., Zhang, C., Sobczak, K., Thornton, C.A., and M.S. Swanson. 2014. Loss of MBNL leads to disruption of developmentally regulated alternative polyadenylation in RNA-mediated disease. Mol. Cell 56:311-322. Mohan, A., Goodwin, M., and M.S. Swanson. (2014). RNA-protein interactions in unstable microsatellite diseases. Brain Res., doi: 10.1016/j.brainres.2014.03.039. PMID: 24709120. Goodwin M., and M.S. Swanson. (2014). RNA-binding protein mis-regulation in microsatellite expansion disorders. Exp. Biol. Med. 825:353-388.